The computer is still your best choice to save photos. You can have huge storage space on a computer and it is expandable, whereas an iPhone has quite limited space for so many great stuff, like apps, music, photos, videos, etc. The iPhone 5 has the best camera to snap great photos in people’s daily life and. However, iPhone is actually not a storage or backup device, its storage is not expandable. Transfer photos from iPhone camera roll to computer is the best solution. If you like to transfer photos from your iPhone Camera Roll to a Mac or PC, simply follow steps outlined below. How to Transfer iPhone Camera Roll to Computer? Most iPhone users might use a cord to connect their iPhone and computer, then import all photos and videos at once. However sometimes we might want to import only the latest photos or specific albums other than all the photos and videos. Also you may want to transfer some photos from iPhone to a computer at work, but find you left the data cord home. Photo transfer on iPhone could be difficult in such circumstances. In this guide, we recommend a professional iPhone photo transfer app, Wireless Transfer App. It is very intuitive to use and takes no time to send any photos from iPhone Camera Roll to computers. Step 1: Run Wireless Transfer App on iPhone. You will get a Transfer URL immediately. 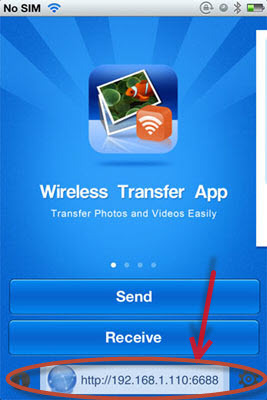 Download Wireless Transfer on App Store. Step 2: Open a web browser on computer to access above Transfer URL. Step 3: Now, you can open and preview all photo albums and photos on your iPhone Camera Roll right on your computer browser. Select photos from the Camera Roll and download them to your computer. Although you can export iPhone Camera Roll photos to computer with the USB data cable and the Windows Explorer on computer, there are many drawbacks too. For example, you have no option to preview the pictures before transfer, it is a none/all option, you can’t pick up and transfer specific photos only. With this Wireless Transfer for iPhone, you can, you can browse through your iPhone Camera Roll and view the photos in thumbs or original size; you can download photos in zip files or original files; you can download specific photos and selections or download a whole folder with all photos beneath.